“Yet” is the key phrase in our title today. 9to5mac is reporting that Apple is preparing to release completely revamped versions of their Macbook Pro line in time for their WWDC in June. They claim to have trusted sources in Apples supply chain who have given them the details of what to expect. Below are the biggest changes you can look forward to seeing. Apple has learned a lot with their pioneering of the ultrabook platform and they intend on these new Macbook Pro’s (MBP) to take advantage of that knowledge. The new MBP’s will reportedly be less than an inch thick, but unlike the Macbook Air’s (MBA) tapered design the new MBP’s will maintain their uniform thickness throughout. But that new thinner design comes at a cost that Apple is willing to pay…there are a few things missing. First there will be no optical drive, something that Apple has already incorporated in their MBA’s and the latest Mac Mini’s. I myself have rarely needed an optical drive since purchasing my own MBA and Apple is betting that most people will feel the same way. If you do need it they still sell an external Superdrive if you aren’t willing or able to use a shared drive from another pc. The second big change that you may miss is an ethernet port. With the prevalence of wifi this was a sacrifice that Apple was willing to make to accomplish this new thinner design. Again, Apple does sell a USB to ethernet adapter if you find that you really need to be plugged in. No word yet on whether these new MBP’s will include flash storage like the MBA’s. The extra speed would be great but alot would depend on how much storage they’d be able to squeeze into this new form factor. Typically MBP’s are purchased by audio/video/photo professionals who require large amounts of internal storage. For now this is a “wait and see” category. With the success of the retina display on the iPhone 4 and now the New iPad Apple is now ready to bring this technology to the MBP line. I’m looking forward to seeing how crisp text and especially images will look on these new larger displays. Supposedly they will no longer define the resolution by numbers (1920 x 1080 etc…) but rather focus on descriptions such as big, small, and optimal. We’ll have to just wait and see if this actually happens. 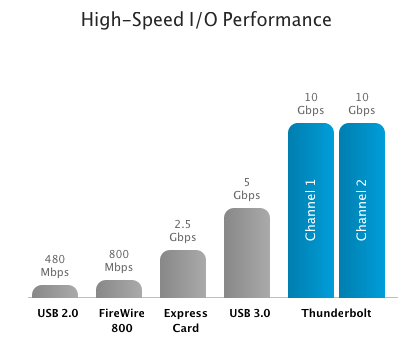 Without a doubt Apple and Intels new Thunderbolt technology offers better speed over USB 3.0. But Apple is playing it safe here and incorporating USB 3.0 in addition to Thunderbolt just in case it takes a while for the newer technology to be adopted by the masses. The biggest challenge Thunderbolt currently has is the lack of available peripherals and of course it’s higher cost. With the inclusion of USB 3.0 Apple is offering a faster alternative that has a much higher adoption rate. None of this information is yet confirmed so we’ll have to wait and see how much may change until the official announcement but there is enough evidence to definitely wait before purchasing a new MBP if you are in the market. I’m definitely interested in seeing the new retina display and am curious to see how thin Apple can make their “power” notebooks. What about you? Will you consider buying these new MBP’s when they are available?